Brazilian teacher, always loving English and this community! 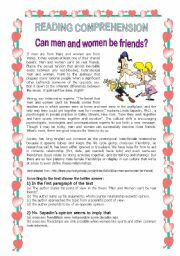 Text "Can men and women be friends?" adapted from: http://www.psychologytoday.com/articles/200109/can-men-and-women-be-friends, with comprehension questions. Thank you!! Degrees of comparison with a good activity to interpret the text and the picture. 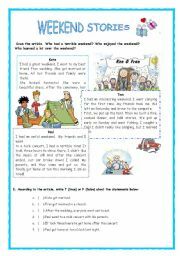 Worksheet to practise the past simple. 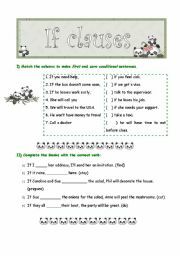 Worksheet to practise the past simple. There are three stories in simple past. After reading ss have to decide if the statements are true or false(2 pages). Images/cliparts from: Google and http://www.nellybeans.com. Thanks!! This is a personality test. Teenagers love it! 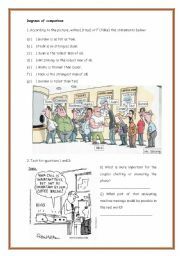 Past progressive appears in the questions showing the practice use of it. 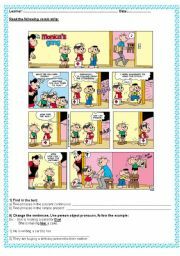 Reading (comic strip) + consolidation exercise about OBJECT PRONOUNS. Thank you!! 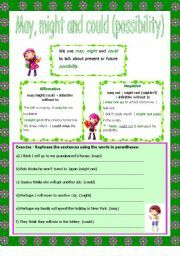 It�s a worksheet I�ve prepared for my students to revise the use of MAY, MIGHT, CAN and COULD. It�s suitable for elementary and/or pre-intermediate. I hope you find it useful!! This paper consists in 30 questions for conversation. 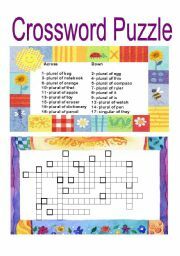 You can create activities using them, use it as warming-up or ice-breaker, or simply have students answer the questions. 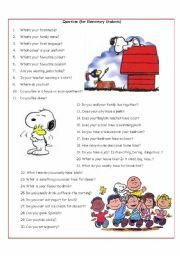 The questions appeal to all ages and students will practice conversation. Thank you! 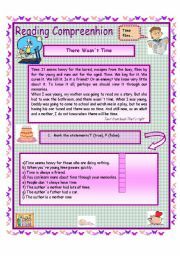 Reading comprehension text about time "There Wasn�t Time", students read the text and do three different tasks. Have a nice week!